One hot summer's day, the fair came to town. Azure begged her mom to take her. After an hour of whining, her mom agreed to go. While Mom went off to look at quilts and embroidered hankies, Azure went on some of the rides. She loved the ferris wheel and roller coaster most of all. After she'd gone on a few rides, her tummy rumbled with hunger. "I wonder if Mom would mind if I spent money on cotton candy. She gave me the money to buy lunch and told me to get a hot dog or hamburger. Cotton candy isn't a hot dog, but Mom isn't around, so she'll never know." Azure bought the biggest bag of cotton candy she could find and it took all of her money. She sat on a bench and ate it until there was none left. Her fingers were sticky and blue and when she touched her hair, it made a big mess and stuck the hair to her face. "Ew! This is horrible!" Not only was Azure a mess, but her tummy felt horrible. "I shouldn't have eaten that much cotton candy. Now I feel sick and Mom will see this mess all over me." 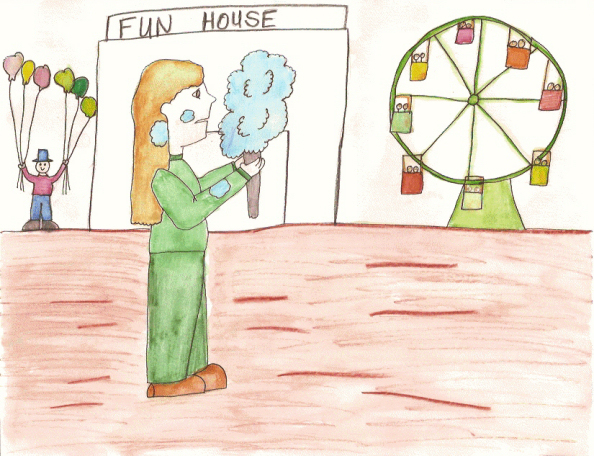 She walked around the fair and tried to have fun. She tossed darts at balloons and played the ring toss game. When she went into the House of Mirrors, she saw herself. She had blue goo all over her clothes, her hair and her face. "I've got to get out of here!" She turned to leave, but couldn't find her way out of the mirror maze. No matter what way she went, she saw her reflection. Finally another person came along and led Azure out. She ran off to find somewhere to wash herself off. She scrubbed her hands and face and wiped the blue mess out of her hair. Feeling better about it, she ran off to find her mom. "Azure!" Mom saw her daughter first. "What happened to your clothes? They're covered with blue!" "Well, Mom, I.uh.um." Azure tried to think of a lie to tell her mom. Mom stared at her daughter, waiting to here the explanation. "Well?" "I can't lie to you, Mom. I didn't have a hot dog. I bought a cotton candy and I ate the whole thing. It made a mess all over me and I feel sick." Azure wiped tears from her cheeks. Mom looked at her daughter. "You're a mess and we need to go home and get you into some clean clothes." "But Mom, I haven't gone on all the rides yet and I haven't played all the games." Azure whined. "You should have thought of that before you disobeyed. Come on. We're going home." Mom took Azure's hand and led her to the car. When they got home, Mom made Azure bathe and wash her hair. She put on some clean clothes while Mom fixed dinner. "Here's something healthy to eat." She put a bowl of chicken soup in front of her, a crusty slice of hot bread and a sliced apple. "Eat up!" Azure enjoyed the meal. "Can we go to the fair tomorrow, Mom?" "We can, as long as you promise to buy something good to eat instead of blue cotton candy." The next day they went to the fair again and Azure did just as her mom had asked and had much more fun!